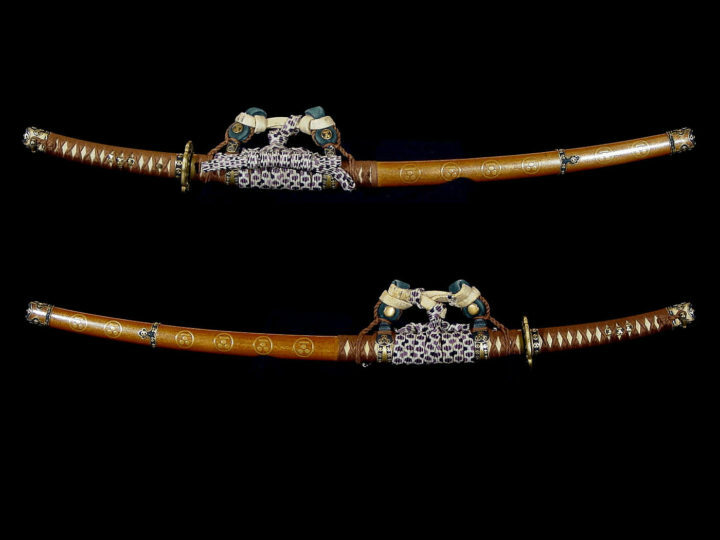 This is a fine Itomaki-no-tachi koshirae from the middle Edo period (ca 1700). Almost all of the metal fittings were made by the Gôtô family as is explained in the Jûyô zufu certification papers. It is in excellent condition with only a very slight loss to one leaf of the wisteria plant. 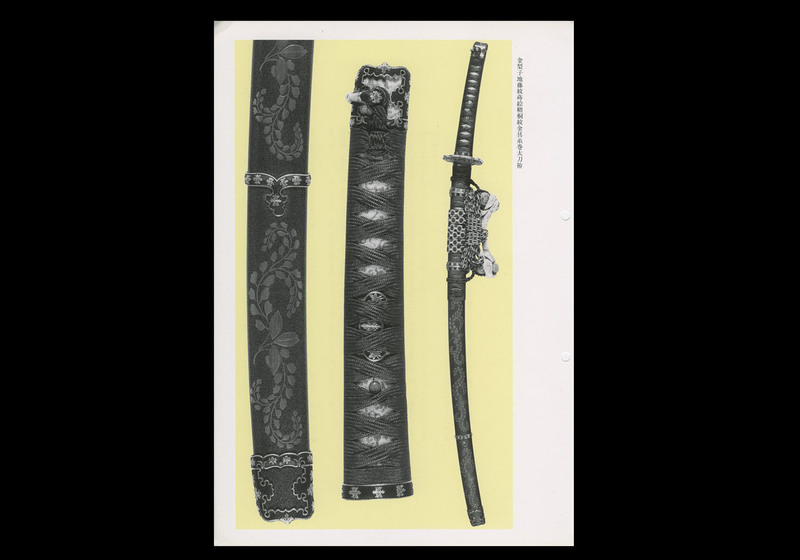 There are a great many koshirae such as this from the late Edo period of the middle 1800’s, but early ones like this are rare and getting more and more difficult to find. 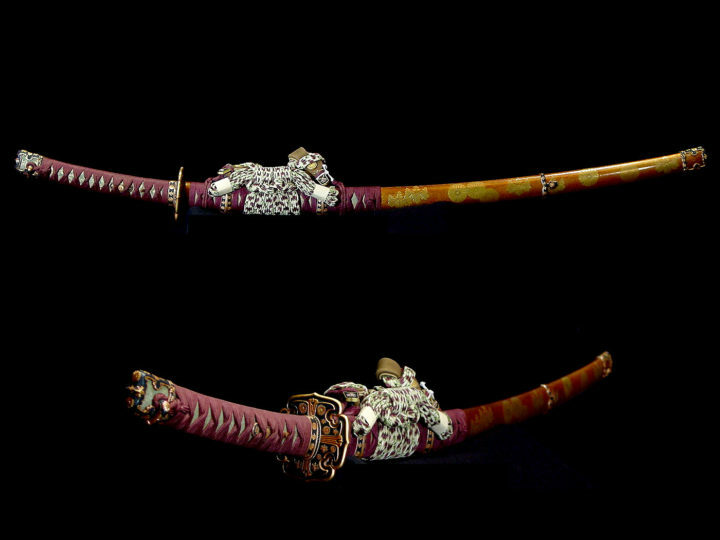 Gold nashiji ground wisteria crests maki-e saya with paulownia crested metal fittings on an itomaki-tachi koshirae. Dimensions: Overall length: 101.1 cent. ; overall curvature: 4.5 cent. ; tsuka length: 24.4 cent. ; tsuka curvature: 0.5 cent. ; saya length: 76.2 cent. ; saya curvature: 2.9 cent. 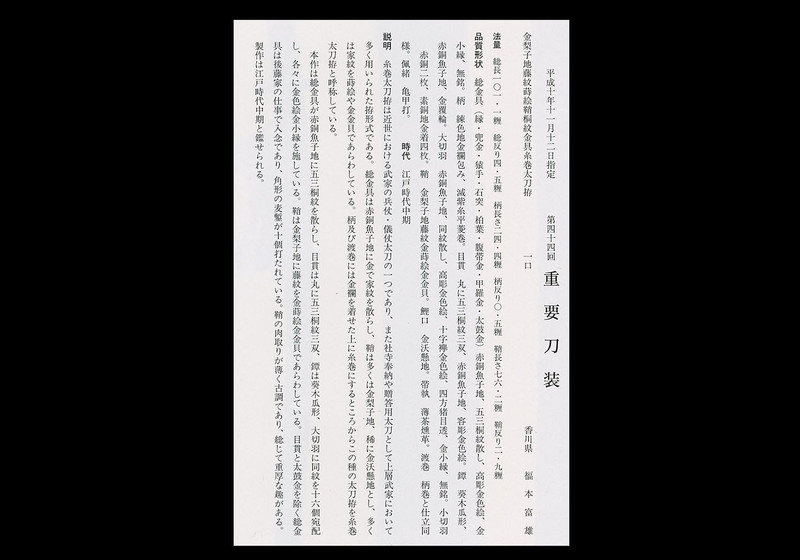 Fittings: The entire metal mounts (fuchi, kabuto-gane, sarute, ishizuki, kashiwa-ba, haraobi-gane, kôra-gane, taiko-gane) are unsigned and have a shakudô nanako ground with a scattering of five-three paulownia crests (go-san kiri-mon) in high relief carving with gold iroe and gold rims. The tsuka is wrapped in gold figured silk brocade and flat wrapped in dark purple silk cord with lozenge-shaped openings. The menuki are rounded and carved in the shape of three go-san kiri-mon in shakudô with nanako grounds and gold iroe. The tsuba is aoi-mokkô-gata in shakudô with a nanako ground and gold fukurin. The ô-seppa are in shakudô with a nanako ground and a scattering of the same crests in high relief carving and iroe with gold rims. The reinforcing metal in the shape of the character for “ten” is in gold iroe and there are four boar’s eye openings. All these pieces are unsigned. There are two shakudô ko-seppa and four plain copper ko-seppa covered in gold foil. The saya has a gold nashiji ground with wisteria crests in gold maki-e and gold foil. The koiguchi is in gold lacquer. The obitori (hangers) are in tan colored leather. 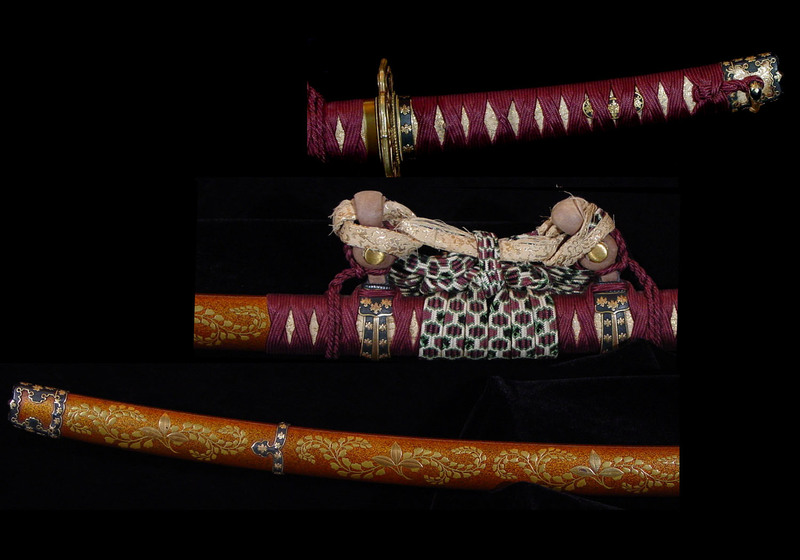 The saya is wrapped in silk brocade and is then wrapped in a manner similar to the tsuka. The sageô has a hexagonal pattern similar to a tortoise shell. 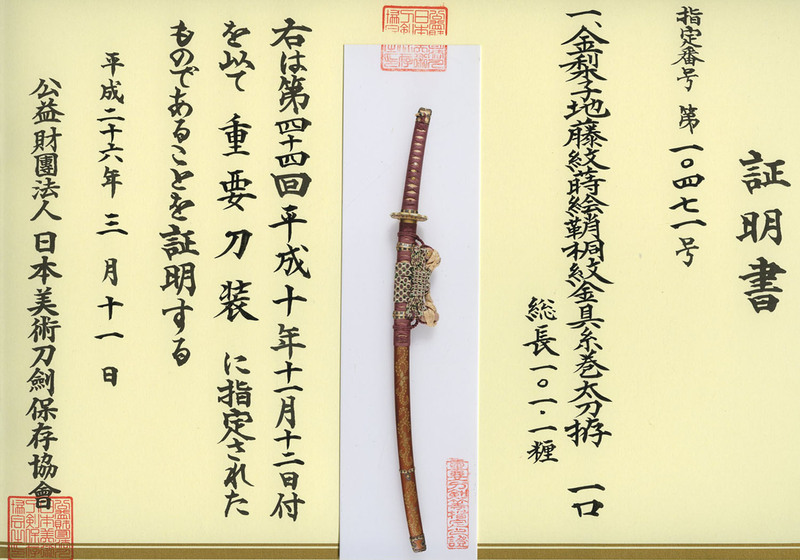 Description: Itomaki tachi koshirae are a type of koshirae that were used as the mounts for the military and ceremonial tachi of the pre-modern warrior families, and, in addition, they were most often used along with tachi dedicated to temples and shrines or given as gifts by upper class warrior families. Their metal mounts are typically made of shakudô with nanako grounds and a scattering of family crests. 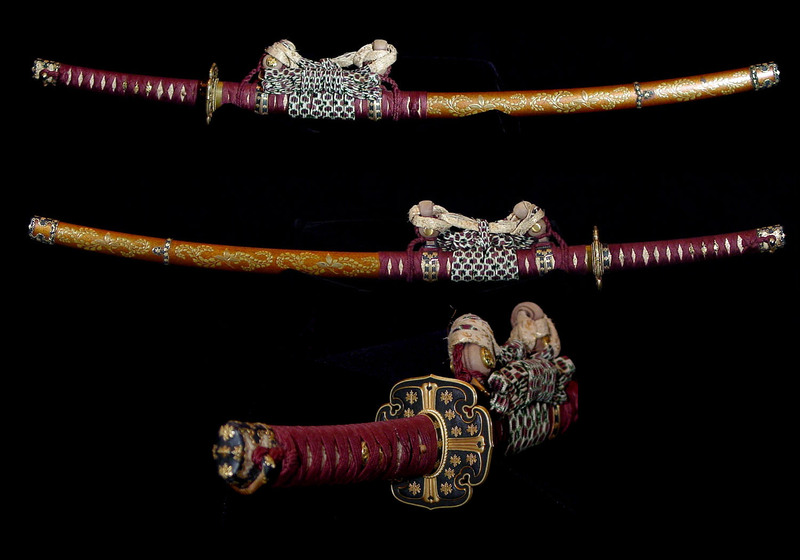 The majority of saya have a gold nashiji ground, or, rarely, are entirely in gold lacquer, and most often there are family crests in maki-e or gold foil. 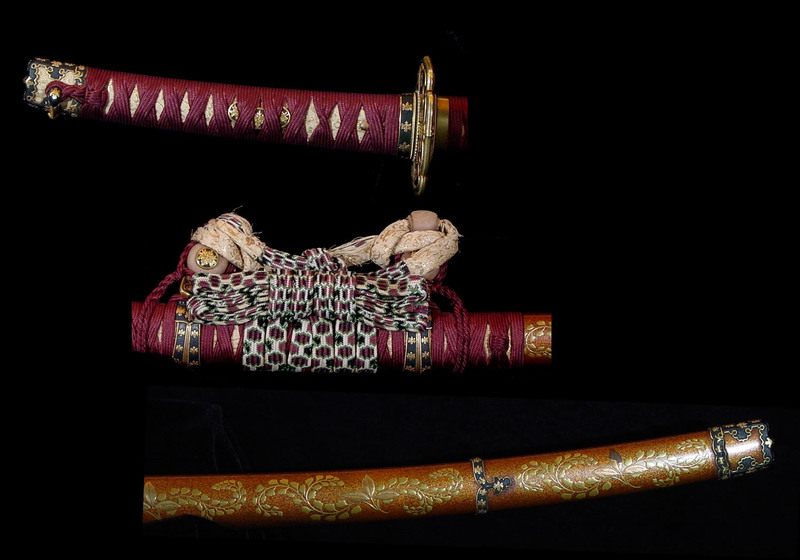 The tsuka as well as the saya are covered in gold figured silk brocade, and above that they are wrapped in silk cord, which is the reason why this type of tachi koshirae is known as an itomaki (cord wrapped) tachi koshirae. The entire metal fittings on this work are shakudô with a nanako ground and a scattering of go-san kiri-mon. The menuki are rounded and have three go-san kiri-mon. The tsuba is aoi-mokkô-gata and the ô-seppa have the same crest arranged around the pieces 16 times. All of the fittings have done in gold iroe with gold rims. The saya has a gold nashiji ground with wisteria crests in gold maki-e and gold foil. Except for the menuki and the taiko-gane, all of the metal fittings were made with scrupulous care by the Gotô family, and there are ten places that have been struck with the square-shaped “mugi-tagane”(the chisel used by the Gotô family to mark pieces that have been issued an origami). The saya is old in style with a lack of rounded thickness, and the entire piece creates a feeling of profound elegance.